This quick gluten-free dish that’s nutritious, delicious and vegetarian friendly. It's highly versatile, and makes a great meal, or side dish. Celiac.com 03/30/2019 - Need a super quick gluten-free dish that’s nutritious, delicious and vegetarian friendly? This stir-fried quinoa is sure to do the trick. 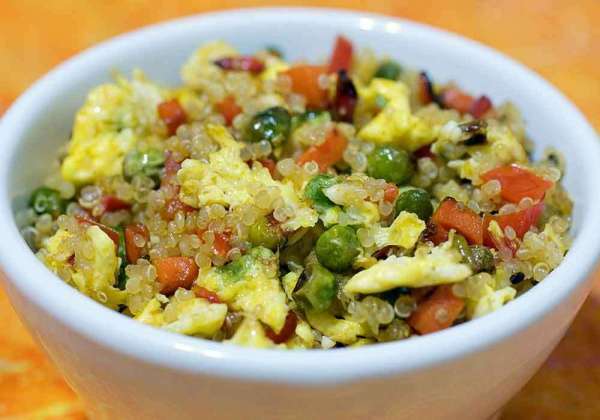 This recipe is a simple blend of cooked quinoa, onions, peas, carrots, and corn. Add some spices, cook a bit, and finish with some fresh scallions, and you can call it dinner. Cook the quinoa according to directions in chicken broth in a medium saucepan about 15 minutes until tender. For best results, make quinoa a day in advance. In a large sauce pan, sauté onion in 1 teaspoon of oil until clear. Add veggies to onions, and cook until veggies are tender, but firm. Drain off any liquid from cooking, and set veggies aside. Heat oil to medium high in a large frying pan. Add quinoa, and stir to loosen grains. Toss in the vegetable mix, soy sauce, ginger and salt and pepper to taste. Stir and cook for a minute or so more. Form a clear spot in the bottom of the pan, and add an egg. Stir egg until it begins to hold together, then incorporate into the rest of the quinoa. Add scallions, and cook, stirring, until done, about 1 more minute. Option: Add leftover beef, chicken or pork, finely chopped. Celiac.com 01/01/2015 - I've been trying to eat more quinoa lately, and this recipe is easy to make, and delivers a tasty, nutritious dish that compliments most any entrée. Sauté onion in oil for 5 minutes, until translucent. Add garlic and carrot, and cook 3 minutes more. Stir in quinoa and chicken broth, and bring to a boil. Reduce to a simmer, cover, and cook 15 to 20 minutes, or until quinoa is tender and fluffy. In a bowl, toss quinoa together with almonds and parsley. Serve hot or at room temperature. Celiac.com 01/03/2017 - Here's a hearty, nutritious rice dish that's sure to bring smiles and mutterings of epicurean satisfaction from family and guests. It's pretty versatile, so add or subtract ingredients as you like, just be sure to account for any extra liquid you might need if you add, say, quinoa to the mix. Extra vegetables should not require too much adjustment. Mix broth, brown rice, and wild rice in a medium saucepan, and bring to boil. Reduce heat to low, cover, and simmer 45 minutes, until rice is tender and broth is absorbed. In medium skillet, melt butter over medium-high heat. Add onions, and sauté until butter is absorbed and onions are translucent and soft. Reduce heat, and cook onions for another 15-20 minutes or so, until they are caramelized. Stir cranberries, peas, and mushrooms into the skillet. Cover, and cook 10 minutes or until peas are done, and berries start to swell. Stir in almonds and orange zest, then fold the mixture into the cooked rice. Is Quinoa a Safe Gluten Free Food? Celiac.com 11/15/2017 - Quinoa is regarded as safe for people with celiac disease. For many years, some celiac support groups listed quinoa as unsafe due to cross-contamination concerns. But any grain is unsafe for celiacs if it is contaminated with wheat, rye or barley. Some grains have a higher risk of such contamination, others have a low risk. Based on its low risk for cross-contamination, Celiac.com has had quinoa on our safe list since 1995. A vast amount of evidence supports that listing. The latest research shows that celiac patients can safely tolerate up to 50 g of quinoa daily for 6 weeks. The researchers in this test point out that further studies are needed to assess long-term effects of quinoa consumption. In the short-term test, the researchers looked at 19 treated celiac patients who ate 50 g of quinoa every day for 6 weeks as part of their regular gluten-free diet. The team evaluated diet, serology, and gastrointestinal parameters, and made histological assessments of 10 patients, both before and after they consumed quinoa. The results show that celiac patients seem to tolerate quinoa well, and it doesn't trigger any symptoms or cause any gut damage or dysfunction. The team found normal gut structure and mucosa to confirm that assessment. In fact, patients saw a general improvement histological and serological results, so better gut conditions and less blood antibodies to gluten in patients who ate quinoa. Celiac patients who ate quinoa for 6 weeks also experienced a mild reduction in blood pressure. Overall, this is the first clinical study to show that celiac patients can safely tolerate up to 50 g of quinoa daily for 6 weeks. Obviously, future studies need to look at the safety of long-term quinoa consumption. That said, quinoa seems to be safe for celiac patients on a gluten-free diet. If you really want to be sure, quinoa grown in main producer countries of Bolivia, Peru and Ecuador, where practically no wheat is grown, is probably the safest bet for those on a gluten-free diet. Celiac.com 11/17/2018 - This soup works great as a dinner starter. It also works great as a full meal when paired with a salad and some good gluten-free bread. Pair it with half a sandwich for a great lunch. The recipe works great if you happen to have leftover chicken in the fridge. If not, you can use rotisserie chicken or leftover holiday turkey. Sauté onions in a skillet over medium heat until translucent. In 5- to 6-quart slow cooker, combine translucent onions, cooked chicken, mushrooms, carrot, celery, cream, rice mix, celery leaves, and the spices. Note: Beware of the spice packet that come with the wild rice mix. Use it only if you are certain it is gluten-free. If you use the packet, omit the other spices. If not, use the spices listed. Gradually stir in the chicken broth and the water. Cover slow cooker; cook on low-heat setting for 6 to 8 hours or on high-heat setting for 3 to 4 hours.